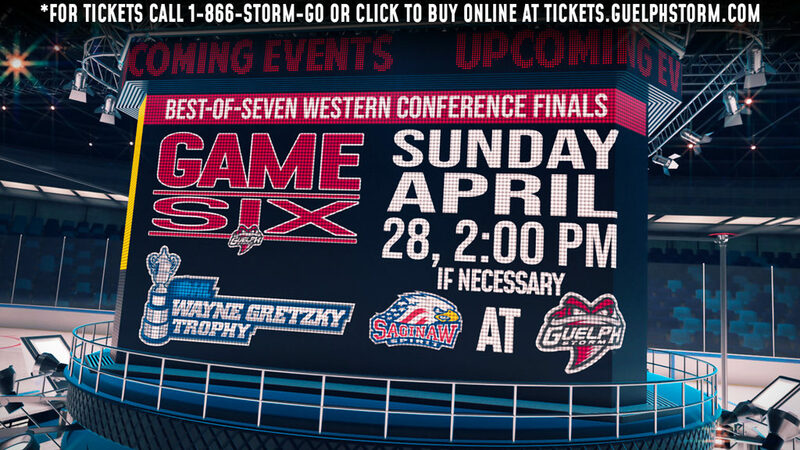 On the surface it looks like a pretty successful weekend for the Guelph Storm. 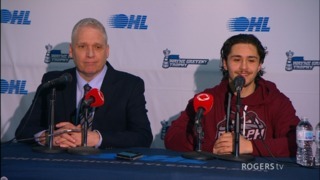 They earned three of a possible four points with a 5-4 overtime loss to Erie on Friday night and a 4-3 overtime win over Sault Ste. Marie on Sunday. But there were some concerning signs. 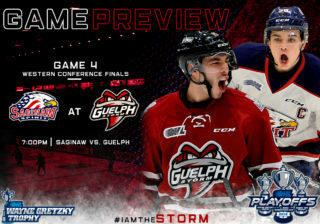 In both games Guelph roared out to a 3-0 lead in the first period but then faltered. 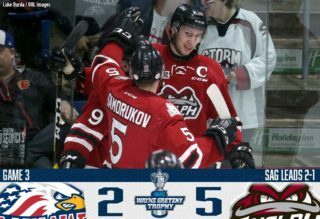 Against Erie the Storm didn’t get their first shot on goal in the second period until 13 minutes had expired. Then after taking a 4-2 early in the third they proceeded to allow three straight goals in a soul stealing loss worthy of Halloween. Sunday against the Greyhounds it was a similar scary story. 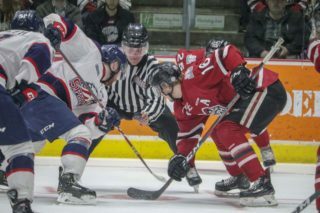 Leading 3-1, they allowed a very good Soo team to tie the game before Ryan Merkley scored in OT to give the home team their first win in 20 games against the Hounds. The challenge is not panicking and sticking together when things go bad. This franchise hasn’t had a lot of experience when it comes to winning over the last four years so the first reaction is often chirping at each other or even the coaching staff when things start to go south. “Just staying calm,” is the key according to Ralph. “We try to take all the negative thoughts away and the negative sayings and stick with positive ones and just put your head down and put in the work. It can be difficult at times but at the same time it’s really just a choice we need to make so if everyone is willing to make that choice of buying in, then it’s as easy as that,” echoed Ralph. So much of winning is mental toughness and not getting rattled but this team has yet to learn that. Had they lost to Sault Ste. Marie and gone 0-2 after having had a three goal lead the discussion may well have been deeper. But a good time out called by Burnett gave them the breather they needed to refocus. 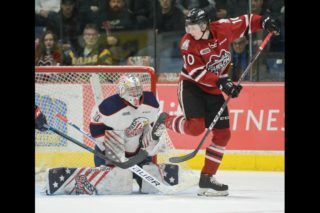 The win Sunday moved the Storm back into first place in the Midwest Division with 18 points (8-4-2), one ahead of Owen Sound (8-6-0-1), and two ahead of London (7-4-2) and Kitchener (7-5-2). But if this team is going to be a force in the playoffs and a truly tough team to play against, they have to learn how to hold leads and hold their composure when things don’t come easily. From the Land of Oz … The Storm’s next home game is Friday November 9th against Barrie and that will be their annual Remembrance Day game. They will wear special jerseys to honour those that gave their lives. After the game all the sweaters will be auctioned off with money going to the local Royal Canadian Legion.